Now there's something you don't see every day, a humpback whale inspecting a new fish farm system from the inside. This yearling likely wandered into Clayoquot Sound with its Mom sometime early morning on March 25. They were first spotted around the Yellow Bank at 09:20 where they delighted several groups of eco-tourists. It took them less than an hour to cover the three miles to the Mussel Rock fish farm where the calf decided to swim between the, as yet unjoined, sections of a new predator guard net. I should note here that this was a new pen being put together to rear smolts to stock the existing farm. On arrival, at 10:35, the very surprised farm crew immediately started to lower the panels to offer a 45' escape route for the youngster. Once they got this happening they called our 'Tangle Response Team' for assistance. It took us about ten minutes to get ready but by that time the young whale had already found its way out and back to Mom. Neither of the whales seemed at all perturbed by the experience as they carried on their inside waters exploration. They were last seen heading for the open ocean in the late afternoon. The fish farm divers immediately started sewing the net sections together and what they didn't get done that day they hauled to the surface for the night. It crossed my mind while writing this that in the last 40 odd years as a naturalist/environmentalist I have seen many changes in human attitude. If this had happened in the 60s or even early 70s, the first thought would have been, "Hey, we should be able to get big bucks for this thing." And the immediate reaction would have been to secure the net so it couldn't get out. There is no such thought these days; the only concern was to get the thing free. Maybe there is hope for us after all. In late March, the big bull Kawkawin (Killer Whale) T044 of Ted's gang T041's) was found floating near Port Hardy. No obvious trauma was found and he had been dead for some time. He was about 33 years old and his relationship with the rest of the gang is unsure. I think it likely that he was a brother to the matriarch T041. We saw these animals in June of our monitoring's first year in 1991. Since then they have visited Clayoquot 57 times that we know of. Here's an excerpt from my Sept. '96 notes; "As the whales rounded Siwash Point, their mood made a complete change. They slowed right down to a speed of perhaps one knot and moved right over to our boat. At this time we were a little confused about what was going on, so we slowed the engine down to a dead idle. Even though we were not at all conscious of trying to follow them, about every two minutes the whales surfaced right beside the boat. This behaviour carried on for almost exactly an hour. At times like this it is hard to keep the Kawkawin in a research perspective. I must confess lapsing into abstract reveries that were much too cosmic to relate in a report such as this. Suffice to say that whales, living under limited visual conditions have evolved into extremely acoustic animals, their hearing is ten time sharper than ours and sound travels five times faster through water than air. I feel that they identify us by the sound of our boat and store that information for recognition at a later date even though it may be a year or so down the road. It's kind of like when you hear a familiar vehicle pull into your driveway, you may not even have to look out the window to know who it is. I believe these Kawkawin know us and that what we experienced was in fact a social interaction between our two species." He will be missed. 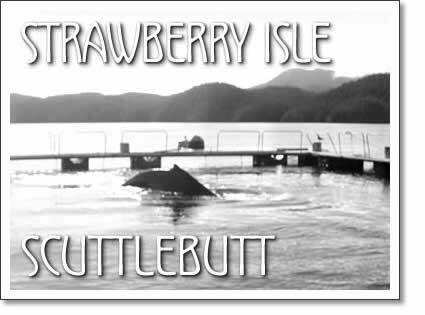 Ucluelet Aquarium: What's new for this year? Tofino whale researcher Rod Palm from the Strawberry Isle Marine Research Society in Tofino writes for Tofino Time Magazine.